He said: “We were close and we often discussed about his life. He was a brilliant young man and he liked helping people. He was in the habit of taking part in free medical outreaches and he loved to study. “Despite his condition, he was still studying further. He ought to be rounding off his post-graduate studies which would have enabled him to become a consultant,” the young associate said. Although it was gathered that the deceased medical practitioner was a sickle cell anaemia carrier, the associate, who pleaded not to be named, said the deceased doctor sometimes had moments of mental instability. The young man added: “Sometimes it happened like a convulsion, and it even embarrassed him at his place of work while he was busy with a patient. Although the family did their best to manage the situation, there were times when he and some members of the family exchanged words because they taunted him for acting abnormally. “His frustration heightened when his father died about four years ago and some family members believed the burden of his health condition contributed to the father’s death. These were some of the reasons he told me at that time that he wanted to end it all, but I tried to encourage him with the word of God”. The close ally also said that the late doctor’s mother had tried to get him a wife but it did not work out. He said the mum, a wealthy woman who owns a number of vehicles, also hired a driver for the doctor as a way of monitoring his movement to prevent him from taking his own life since he had exhibited such tendencies. “The jeep (SUV) he was riding belongs to the mother and she also got him a driver to take him around. The mother tried to arrange marriage for him at a time but it did not work. The deceased’s younger brother is already married and his sister is also a medical doctor,” the source said. When one of our correspondents visited the Odunukan residence of the deceased on Thursday evening, a sober atmosphere pervaded the entire street. One of the residents, who identified himself simply as Mr. Oluwole, recalled that Oluwole had attempted suicide about four years earlier, adding that he saw Dr. Orji walking past the Saturday before his death. Oluwole also believed that things could have turned out differently if the deceased doctor’s family had not changed his driver. He said: “It won’t be out of place to describe him as a recluse. He was not on the social media, neither did he engage in any social activity. 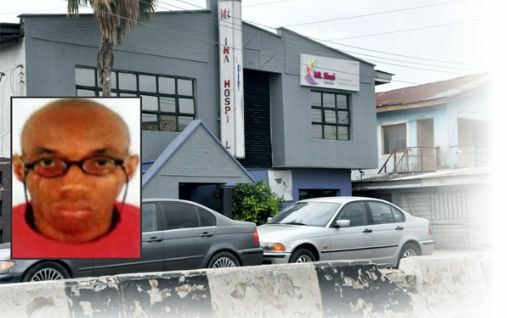 It was just like any other Friday when the late Orji resumed work at the branch of Mount Sinai Hospital on Ojekunle Road, Papa Ajao, Mushin, on March 17. The storey building housing the hospital overlooks the dual carriage road that is popular for the spill-over of heavy commercial activities from the nearby Ladipo Market. Although it is sandwiched by two very close buildings, Mount Sinai Hospital wears a bright colour that makes it easily noticeable. It was here that Orji reported last for duty as a medical doctor before he gave it all up two days later on a bright Sunday afternoon. He was said to have stopped his driver on the Third Mainland Bridge, got out of the vehicle and jumped into the Lagos lagoon. A colleague of the deceased, who did not want to be named, said that Orji’s last day at work was like every other. He said: “He was cheerful on that day and attended to patients in his usual cheerful manner. There was no slightest indication that something was amiss or anything to indicate that he was depressed or bothered by something. If there was any sign, it was not obvious at all. If there was anything amiss, that would be his personal life which, of course, we couldn’t have been part of,” the colleague said. A nurse at the hospital, who fought back tears as she spoke, also described the deceased Orji as a cheerful individual. “Everybody here will miss him. He was a jovial person. He loved his work. He was someone we enjoyed working with. That Friday was his last day at work here,” she added. One of the doctors, who appeared shocked by the incident, referred our correspondent to the Communications Manager at the Surulere branch of the hospital. “It is the Communications Manager who has the mandate to say anything about the late Orji. I am sure that the hospital will communicate an official position about the incident in due course,” the doctor said. At the Surulere branch of the hospital in Lagos, however, the Communications Manager was not available to speak with reporters. But an official of the hospital who would not disclose his name said that while he shared the sense of loss, he would not answer questions concerning Orji’s personal life.